When a well-read newspaper incorrectly reported that Glendale had issued a citation to a homeowner for not keeping their lawn green during drought conditions, Glendale’s proactive approach to public relations quickly proved its worth. With California facing one of the most severe droughts on record, Glendale, like most cities across the state, was in the process of developing tighter water conservation measures. But in 2014, a few areas that lagged behind still treated brown lawns as a misdemeanor. When a well-read newspaper incorrectly reported that Glendale had issued a citation to a homeowner for not keeping their lawn green (when in reality it was another town with a similar name), Glendale’s proactive approach to public relations quickly proved its worth. The city’s website, www.glendaleca.gov, was designed by an online government team at Vision Internet. 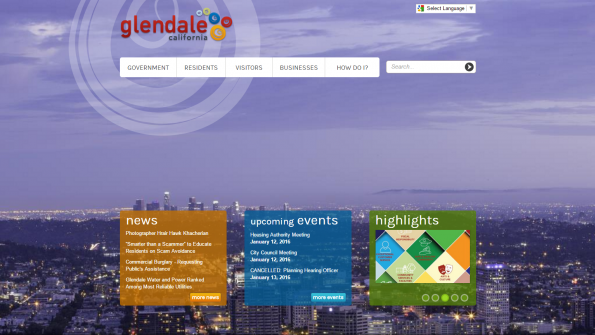 It was launched two years ago and features the content management system and responsive design that Glendale needs to bring proactive government to its tech-savvy population of nearly 200,000. Using the website, citizens can access up-to-the-minute information in a format that fits any mobile device. Additionally, the site’s social media connections, via Facebook, Instagram and Twitter, make it a hub for citywide communications. Emergency flash pages have been developed for instant posting to the site’s homepage, as well. Glendale’s Rumor Page, which regularly distinguishes facts from fiction, is now one of the top 10 pages viewed on the site. Information is posted as soon as an incident arises. The page shares the facts and includes links to supporting documents that provide additional information. Lorenz says posting that same information on social media helps the city create a “village of informed citizens” that can help set the record straight when misinformation begins to spread. Click here to learn more about Vision Internet.